Below are some reflections from previous participants. If you would like to speak with someone who has participated in a UUBorders trip, please let us know and we can arrange that. The Discovery Doctrine was not new to me but the connection to neo-liberal economic policy now feels evident in a way I had not realized before our ongoing discussions. I’m pretty aware of the humanitarian crisis that our immigration policy in the U.S. is causing, primarily since S-Communities. I know the roots of immigrants’ misery are deep in our foreign policy. To tell you the truth, I didn’t think I needed to take this Border Trip, well, I’m glad I did because it was an uplifting, spiritual experience. I came away with a deep sadness to know that in this day and age – with all of our technology and abilities to build rockets and missiles and super computers – we haven’t found a way to ease the human pain and poverty and suffering at our common border with Mexico – except perhaps in little pockets of human movements. We’ve moved away from being close to the earth and its beings and into a weird material and cyber world that has cut us off from our roots in our ‘tierras’ and spiritual connections …. Singing, singing the songs we know and singing them in Spanish (which we don’t know so well); singing for ourselves and singing for our friends. Music is a great gift to share, and doesn’t have to be perfect– just enthusiastic — to work magic. Sharing. By sharing our thoughts about the experience we connected as UU’s and as humans on a deeper level. The times of ritual sharing made the weekend a spiritual retreat as well as an educational opportunity. As always I’m blown open by the responses, stories and ideas of my fellow humans. As I have done on a number of occasions through my work with the Immigrant Justice Action Team of the UU Justice Ministry of California, this past weekend I took an incredible group of travelers on a Justice Journey to Tijuana as part of our UUBorders program to learn firsthand the injustices of the US immigration laws. The 6 UU travelers included 3 ministers and one Christian priest from Argentina. As often happens Miracles can appear. We visited a cafe and community center associated with Food not Bombs. There we met Nicole Ramos, an immigration attorney and tireless advocate for asylum seekers (and a former guest on UURoundtable). She had been working with the LGBTQ Migrants who had completed an arduous and dangerous journey across Mexico. Each hoped to apply for asylum. In our conversations Nicole shared that 14 members of this community of Migrants, 7 couples, would like to get married. Would we be able to marry them? And of course with great joy we said YES. We were deeply grateful that this community of courageous Migrants welcomed us and trusted that our 3 ministers and a priest could create a deeply moving wedding ceremony in Spanish. And indeed they did. 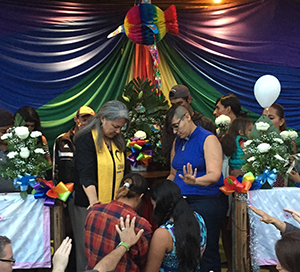 Although the marriages would not be recognized by Mexico, they would be recognized by the UU Church of the Larger Fellowship, an international congregation known around the world. But our Faith leaders were not the only hands at work. A member of our group found a jeweler to provide silver rings; others provided wedding cakes, others provided bouquets. And still other hands created a beautiful altar in front of the cafe with flowers and a Rainbow Flag draped with exquisite effect. So 4 hours after Nicole’s request, a wedding with 7 ceremonies began. As each couple married, the joy and love they had for each other was visible in their smiles, laughter and affection. And the love and support they received from their LGBTQ Migrant Community who surrounded us was amazing. Yes the Miracle of what love can bring grew and intensified with each marriage and filled this plaza and touched us all. We may not know what tomorrow will bring, but we who were so fortunate to witness and experience this evening. We will carry with us this gift of a Miracle from an amazing and courageous community. I have been on three border trips, beginning with my first one in July of 2014, and though we went to many of the same places, each one was a unique experience. For those who have done Immigrant Rights and Justice work in their churches and communities in the US… a UU Border Trip gives you a view of that “next step” that we are trying to prevent. You see what happens to undocumented immigrants when they are deported. I live seven miles from the border in San Ysidro so I have been able to maintain contact with The Deported Veterans and Dreamers Moms and I go to many of their rallies and events. A UU Border Trip is not the same as a trip to do humanitarian aide, (such as building a house with Habitat for Humanity) On a border trip you learn about Immigration and Deportation Issues and you meet people from Social Justice organizations in Tijuana, many of whom are deportees, who have formed organizations to help other deportees survive, and to do social justice and political advocacy work to help change immigration and deportation laws in the US. Especially now, with increased numbers facing deportation , it is more important than ever that we understand these issues and there are few experiences that can help you do that as well as a UU Border Trip.